Fred gets cast in a soap opera, All My Tomorrows, which is haunted by the spectre of an actress who used to work on the show. Shaggy and Scooby, who get jobs on set, run into the ghost – or rather, two ghosts, but they’re both unmasked and revealed to be: the very much alive actress (who faked her death as part of a scam to get a bigger contract) and some agent who was angry at all his actors not getting cast on the show. A one-page story about Daphne being more frightened of someone’s bad fashion choice than an actual ghost. Well…okay. While on a whale-watching trip, the gang encounters a sea monster, but it turns out to be an elderly fisherman they befriended in disguise. He’s scaring off fisherman who have been overfishing the fish and screwing up the environment. Another one-page story; Velma invites Scooby and Shaggy over for lunch but realizes she can’t give them anything to drink because she can’t find her glasses. Get it? It’s a pun. 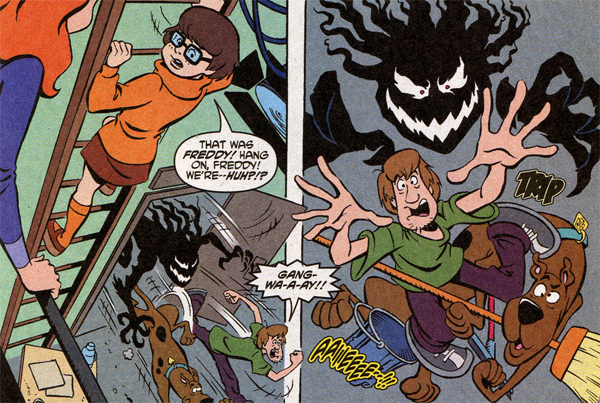 Scooby and Shaggy are pursued by a monster in a rich dude’s backyard maze. 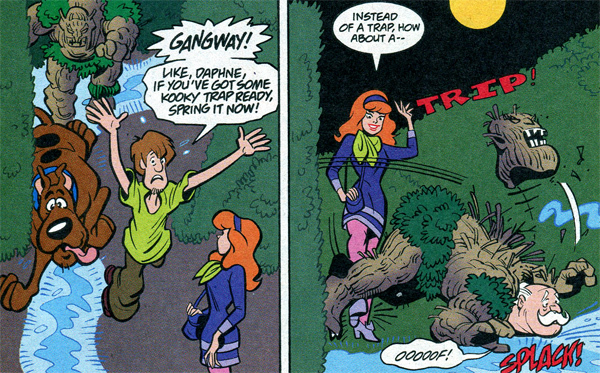 Daphne trips the monster trips and his mask flies off – why, it was the rich dude! He got jealous watching people have fun in his maze and wanted to have fun himself. Well. That sure is a motive. Hope he gets off with a light sentence. When the Mystery Machine breaks down, Fred upgrades to a sleeker, more modern van. But this van has problems…it’s been sabotaged! Fred manages to steer it into a van belonging to the saboteur, a man wanting revenge ’cause his buddies got arrested in previous adventures. 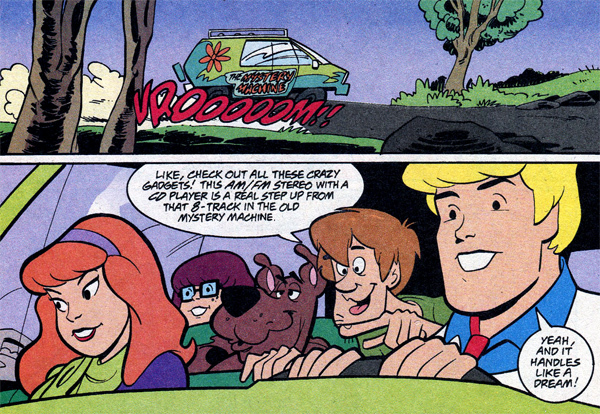 Predictably, the gang goes back to the original Mystery Machine. The bad guy is caught…whoever he is! They say variety is the spice of life; this comic is pretty thick and filled to the brim with stories. But they were all so short (some of them being simple, one page gag stories) and as soon as the story got going, it was practically over! They usually start off introducing a guest character or two, followed by a monster chase, wherein it’s pretty quickly unmasked and we see – hey, it’s that one guest character we just met. The first story, for instance, had a lot of potential and I was disappointed in how quickly it got resolved. I also thought it was dumb that the actress faked her death and went into hiding for 24 years so she could scare people later, when she could’ve been using those 24 years to actually…do something with her life. I did really like the ending of Fishy Story where the gang actually lets the guy go because he was scaring people off for a good cause. How many times does that happen in Scooby-Doo? As for the one-pagers: Oh No, Not Again! was funny and cute, while The White Shoe Scare garnered an eye roll. 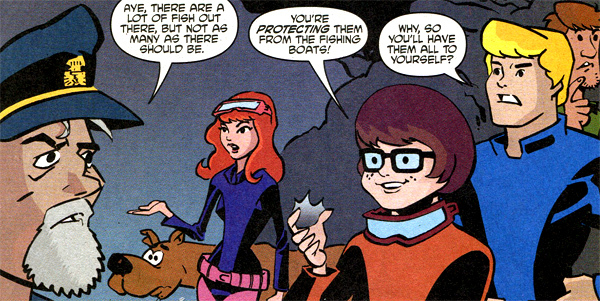 Go elsewhere if you’re looking for actual mysteries, but read it if you just want to hang out with the Scooby gang. Scooby-Doo, Where Are You? Episode 6: What the Hex Going On? The joke at the end of “All My Tomorrows” puts me in mind of the white shoes that figure prominently at the end of John Waters’s “Serial Mom,” where they perhaps get a bigger laugh. — A vampire who is a recurring character in the Mercedes Thompson novels of Patricia Briggs, by name Stefano Uccello (being of Italian origin), is a great fan of Scooby Doo and and has and drives his own Mystery Machine van. By golly, you’re right! I haven’t seen Serial Mom, so that reference flew over my head.